Thank you for your interest in employment with the Bangladesh Army University of Engineering & Technology BAUET Job Circular in Bangladesh. We sure that you will find the better information provided below.Bangladesh Army University of Engineering & Technology BAUET authority has circulated job circular in recent times.This is your chance to share your story and connect with job field in our country. As a hoping for a job, you’ll represent your skill and qualification. Please note that resumes/cv send only not direct interview or other communication. Bangladesh Army University of Engineering & Technology (BAUET) the pioneer Technical Institutes of Armed Forces, started its journey from 15 August 2014. It was the visionary leadership of the Honorable Prime Minister of People’s Republic of Bangladesh Sheikh Hasina to establish a Technical Institute of Armed Forces. Accordingly, the Honorable Prime Minister, People’s Republic of Bangladesh, Sheikh Hasina unveiled the Foundation Plaque on 15 August 2014.BAUET is located at Qadirabad Cantonment in Natore.To get Bangladesh Army University of Engineering & Technology BAUET job circular 2019 related all information ,you can visit my website that is jobs.lekhaporabd.com. It’s an attractive job circular. Anyone,can take this opportunity. Everybody, want to build their career,in this case they can to apply to get this job. 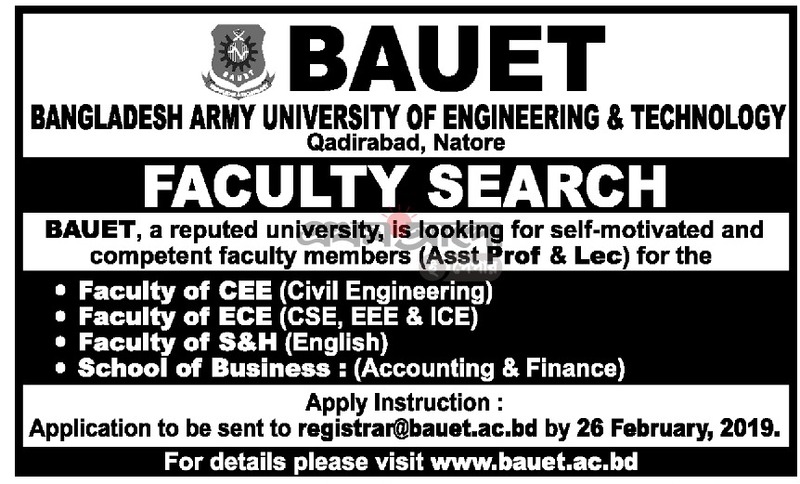 Bangladesh Army University of Engineering & Technology BAUET offer people for exciting career opportunities. Educational qualifications are too much important for this job If you want to apply for this job, you should submit your application within short time.Bangladesh Army University of Engineering & Technology BAUET job circular 2019 has been converted to an image file,so that people can easily read and download this job circular. Bangladesh Army University of Engineering & Technology BAUET job circular has been given below.